She is definitely back. Is she ever. 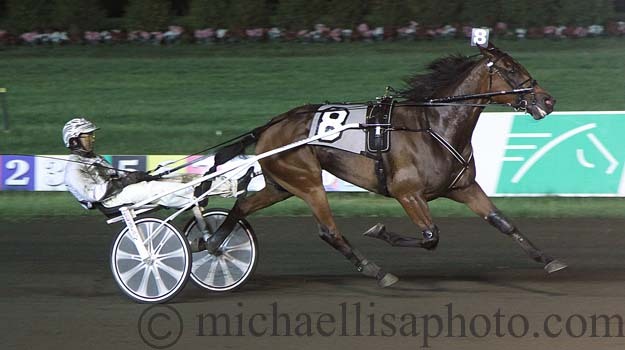 Bee A Magician did it again last night, winning the Arthur Cutler Memorial at the Meadowlands. In the process, she kept her 2015 record perfect at 3 for 3 and became the first mare ever to win this race. Next up for the super mare and 2013 Horse of the Year will be Sunday’s Maxie Lee at Harrah’s Chester, which will be a battle of the sexes between her and Father Patrick. The latter is pointing for that race after a winning qualifier yesterday morning at the Meadowlands. Though Bee A Magician was undefeated in 2013 and named Horse of the Year that year, no one saw this coming. She was just 4 for 17 last year and never seemed like the same horse that was so dominant at three. But she began 2015 with a win against males in an Open at Yonkers and followed that with a win last week in a prep for the Cutler at the Meadowlands, winning from post 10. Last night, she was even better. With Brian Sears back in the bike after Scott Zeron subbed for him last week, the 5-year-old daughter of Kadabra made a huge move on the backstretch to grab the lead. She was 1 1/4 lengths in front after a half in 55.2 and 1 ½ length clear after three-quarters in 1:23.4. Down the lane, it was a one-horse race as she was not seriously challenged by any of her nine male rivals. She won by two lengths over Wind Of the North and went the mile in 1:51.2. With Melady’s Monet finishing third and Appomattox fourth, the first four finishers last night crossed the wire in the exact same order they did a week ago in the prep. Train er Nifty Norman has said that Bee A Magician looks like a completely different horse this year, a sentiment echoed by McDuffee. The other highlight on last night’s card at the Meadowlands was the successful 3-year-old debut of Dan Patch Award winner Artspeak. The Brittany-bred son of Western Ideal had a bit of a bumpy road getting to last night’s race, breaking in his first qualifier and then finishing fifth in his next. But trainer Tony Alagna had him ready to go last night in New Jersey sire stakes action. Sent off at 3-2, a sign that the bettors weren’t totally convinced that he was back to his top form, Artspeak won by 3 ½ lengths in a career best 1:49. Driven by Scott Zeron, he blasted to the lead on the backstretch after sitting fourth early and then had no problems holding off second choice Gokudo Hanover. Alagna said he wasn’t sure what was next for Artspeak, but said it’s most likely he will bypass the next leg of the New Jersey Sire Stakes series. Favorites dominated in the first two sire stakes races as Lindys Old Lady kicked things off with a win for trainer Frank Antonacci and driver Tim Tetrick, paying $3.20. She is 2 for 2 in her young career. Happiness won the next event, besting Stacia Hanover to win the race for 3-year-old New Jersey bred fillies by 1 1/4 lengths. She paid $2.20. Still another chalk won the final sire stakes on the night as Hurrikane Ali visited the winner’s circle in race nine, paying $3.40.